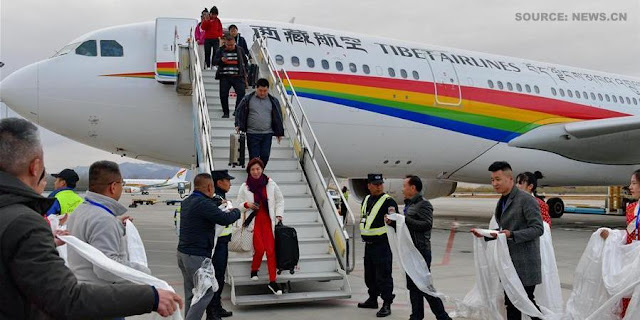 On April 9, 2019, Tibet Airlines launched a new air route connecting Tibet Autonomous Region's capital Lhasa with Helsinki, via Jinan, Shandong Province. Tibet Airlines became the first Chinese airline company to commence commercial flights from Jinan, China, to Finland on April 8. The new air route is operated with Airbus A330 wide-bodied aircraft twice a week on Mondays and Thursdays. Kindly note, Tibet Airlines has just 12 business class seats on their A330s, in a 2-2-2 configuration. Representatives from the regional tourism development department and Tibet Airlines greeted the 240 passengers at Lhasa Gonggar Airport by offering them a "hada" (traditional Tibetan ceremonial scarf). Both issued a joint statement as reported at SINA news website - "this new route will attract more tourists from eastern China and at the same time, it will also attract Europeans to visit Tibet." The region received 33.68 million visits from tourists in 2018, an increase of 31.5 percent year-on-year, according to the local media report. According to Bai Weisan, President, Tibet Airlines, "Tibet Airlines is looking forward to continuing to maintain a mutually beneficial and win-win cooperation concept with Finavia and Helsinki Airport, to carry out more extensive and in-depth comprehensive cooperation in the future." According to Joni Sundelin, Director, Finavia, "The new Tibet Airlines’ route between Jinan and Finland reinforces Helsinki Airport’s position as a significant hub for travel to Asia. It directly connects the Shandong province and Finland, and we warmly welcome Tibet Airlines here at Helsinki Airport." Last December, President Donald Trump signed a bipartisan bill H.R. 1872, the "Reciprocal Access to Tibet Act of 2018," which seeks to impose a visa ban on Chinese officials who deny American citizens, government officials and journalists' access to the remote region of Tibet. The opening of Tibet for more western tourist, especially from Europe - in a controlled fashion can be considered as one type of "charm offensive" to dilute American standing on Tibetan issue in front of its allies.